X-Calibur International is pleased to announce the appointment of Raffy Garabedian as Export Manager. Raffy studied International Law at Beirut University and Marketing at Wits Business School in South Africa. 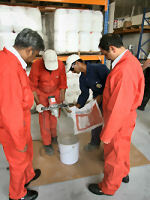 He has over 22 years experience in the construction chemical industry in France, CIS, North & West Africa, Kuwait and Dubai. Raffy will be responsible for expanding X-Calibur’s licensed manufacturers and franchisees in Asia, Africa and Arabia. He will operate from X-Calibur International’s newly opened offices in the Sharjah Airport Free Zone in the United Arab Emirates. His appointment is the latest in a series of high level appointments in the X-Calibur Group as it continues to expand internationally. 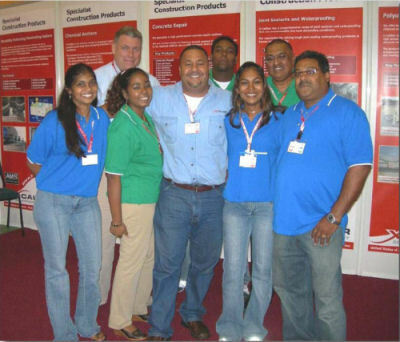 X-Calibur Constructions Systems Inc exhibited at the Building and Interiors Trade Show held from 4th to 7th October 2007 at the Center of Excellence at Macoya, Trinidad. The show is the premier construction industry trade show in the Caribbean attended by industry professionals throughout the region. The stand was manned by X-Calibur`s Brian Davies and Charles Idowu and staff from X-Calibur`s distributor in Trinidad National Coatings. Charles Idowu VP commented "this show has been of great value and has helped us increase our presence in the Caribbean market. Being Miami based we are in an excellent location to provide technical support and quickly ship product". During the show X-Calibur took the opportunity to launch X-Tite ResiLoc EX a high performance epoxy anchor grout dispensed using X-Calibur`s SMRTM Technology providing a high strength fast cure chemical anchor for structural fixings. The stand was designed specially for the show. 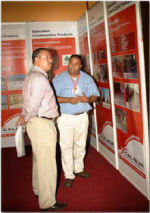 Charles Idowu explaining the benefits of X-Calibur`s flooring range to a visitor to the stand. X-Calibur International recently hosted a Product Inductionproduction team Course at the X-Calibur Emirates Production and Training Facility located in Sharjah Industrial Area in the United Arab Emirates. Called the Product Boot Camp by X-Calibur CEO Brian Davies, the course is an intensive three day program designed to introduce new recruits to the wide range of-Calibur products. 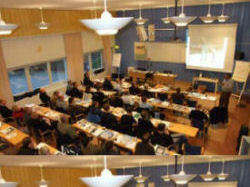 It consists of theory and practical hands on training. 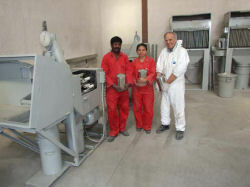 The course was attended by staff from Apitech X-Calibur on Dubai and Virtus X-Calibur in Kuwait. The Product Induction Course is held every 6 months at various locations worldwide and is open to any employee of the X-Calibur group, affiliate or distributor. We are pleased to announce the appointment of Simon Wallace as the Sales Director of its joint venture in the United Arab Emirates. He has also been appointed to the Board of X-Calibur International FZC in the position of Chief Commercial Officer. Simon holds an Honours Degree in Civil Engineering from the Heriot-Watt University in the United Kingdom and a MBA from The Open University, UK. He started his career in the UK as a Civil Engineer with contractor Kier Management Ltd later with consultant Mott MacDonald. Prior to joining X-Calibur, he was employed by a regional construction chemical company as the Sales and Marketing Director. Prior to that appointment Simon was the National Sales Manager for Ruberoid Building Products, UK and before that as Area Manager with Fosroc Expandite Ltd, UK. We are extremely fortunate in having such a high caliber individual join our Group. 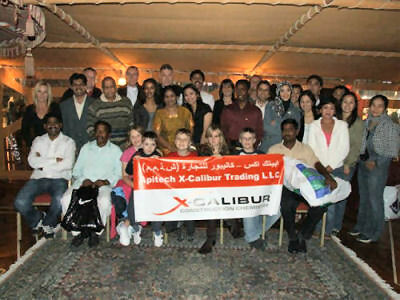 X-Calibur Group to assist with the global role out of the X-Calibur brand. We are pleased to announce the appointment of Carl Munn as its General Manager of Apitech X-Calibur our joint venture in the United Arab Emirates. He has also been appointed to the Board of X-Calibur International FZC in the position of Chief Technical Officer. Carl holds an Honours Degree in Chemistry from the Liverpool University in the United Kingdom and holds various post graduate qualifications in quality and manufacturing. 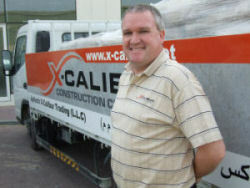 Prior to joining X-Calibur Construction Systems Inc, he was employed for a major UK Construction Chemical Company in senior technical and commercial roles for 18 years. Carl’s role is to continue the growth of the X-Calibur Group of Companies in the United Arab Emirates along with the development of world class product development and quality system for the X-Calibur Group. Carl is one of the several senior executives who have recently joined the X-Calibur Group to assist with the global role out of the X-Calibur brand. X-Calibur International FZC has joined the Nordic Industrial Group (NIG); a consortium of 50 companies that collaborate on major concrete refurbishment projects through out the Nordic Region. Apitech X-Calibur Staff at their annual staff party on board a traditional Arabic Dhow on Dubai Creek. The party was the culmination to a an excellent year for our Dubai company which in a very short time become a key player in this exciting construction market. X-Calibur® has purchased the fiber cement braiding line and technology from Stelmar Technology Ltd following their exit from this business line in 2006. The equipment is to be used to produce X-Seal™ 3C AF and X-Pruf™CrystalBraid™. X-Seal 3C AF is a cold caulking cord used in high pressure applications such as cast iron tunnel segments, sheet piles and high pressure pipe joints. X-Pruf CrystalBraid has been specifically developed for use in demanding water stopping situations and utilizes X-Calibur’s CrystalTec™ technology. 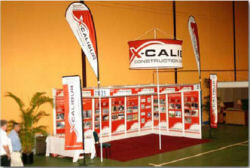 X-Calibur is now the only company in the world who has the ability to produce this type of product. 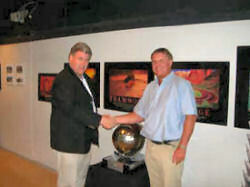 Mike Roper the Managing Director of Stelmar Technology whose valuable knowledge and experience was utilized in relocating and re-commissioning the production line remarked. 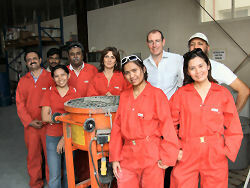 Mike Roper with X-Calibur Technical Staff after the first production run. X-Calibur International is please to announce the appointment of KS Narayanan (KSN) as its Finance Director. He holds a BSc in Chemistry and is a Chartered Accountant. 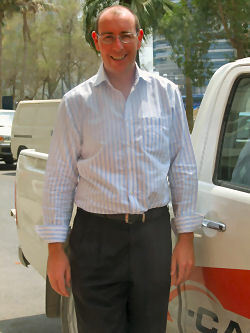 He has over 25 years experience in the construction chemical industry in finance and supply chain. His appointment is the latest in a series of high level appointments in the X-Calibur Group as it continues to expand internationally. KSN will be working very closely with the Group CEO Brian Davies to ensure that all companies in the group operate to high levels of corporate governance. He will also be a key member of X-Calibur’s acquisition team searching for suitable investment targets.